The first half of the event was the talk show, “Are We There Yet? (I’m Innocent!”) during which Max Rykov interviewed Ralph Hendrix, Program Manager for UAB's Treatment Alternatives for Safer Communities, and the Public Defender herself, Kira Fonteneau, about the various realities of indigent defense and the criminal justice system in Jefferson County. 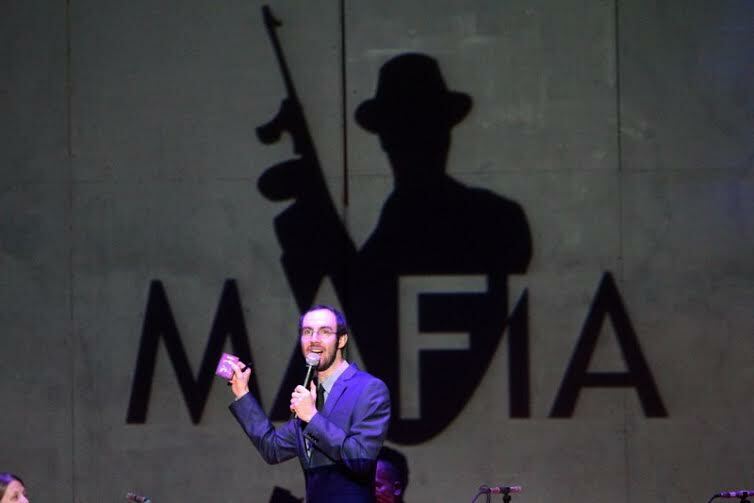 The second half of the event was a live playing of one of the world’s most beloved and entertaining roleplaying games, “Mafia”. "Mafia" featured thirteen of Birmingham's most dynamic personalities, all relying on charm, persuasion, secret alliances, and outright deceit for the sake of their team’s victory. Each of the thirteen players will take on either the role of mafia members, or one of numerous characters making up the remaining majority of innocent “townsfolk”. During the course of the stage production, players will have to defend themselves when put on trial for suspected mafia involvement, without the benefit of a trusted lawyer from the Community Law Office. Our players were: Courtney Haden, Glenny Brock, Christopher Davis, Mike Cunliffe, Jan Hunter, Sharrif Simmons, Patricia Todd, Kira Fonteneau, Fred Weaver, John Archibald, Thyme Council, Chatham Hellmers, and Randall Woodfin.